Essay sample for university is a piece of academic writing that intents to analyze or evaluate particular issue or topic. One of the most typical types of an essay is an informative essay. An informative essay is one of the most basic form of an essay. It can come in many ways and its primary purpose is to inform, as well as educate an audience. Moreover, an informative essay is not used to persuade but to present opinion on a particular subject support by the textual and factual evidence. It is essential to mention that such type of an essay consists of three main parts. The first part is an introduction that is used to grab reader’s attention. The second part is the body, and its purpose to present the most crucial facts regarding the topic. The final part is conclusion, in which a writer summarizes the topic, as well as encourages audience to seek more information on an issue. Therefore, essay sample of university is the type of academic work that presents an issue or particular topic. Moreover, such academic piece should fit the requirement for the University level of writing. In the near future, it is possible that a person will not be able to recognize the climate of the Earth. That can happen because of rapid environmental changes. One can say that the initial stages of environmental changes people can observe even nowadays. Despite the notion that the climate change is mainly a natural process, there is an explicit evidence suggesting that because of the human influence the process became unnaturally unstable. Therefore, to present the notion of climate change, it is necessary to explore the scope of human influence on it, as well as elucidate the possible negative results of such interaction. Many prominent scientists refer to a climate change as, “One of the greatest threats facing future societies.” The atmosphere of the Earth has been changing for thousands of years. However, what have been disturbing scientists is that the climate change that occurs nowadays is proceeding at an unprecedented rates comparing to the past thirteen hundred years. After studying an issue, a person can talk about two kinds of causes for a climate change. The first one is related to the natural changes that occur on the planet. Majorly, due to the volcanic eruptions, massive amounts of Carbon Dioxide is ejected to the atmosphere that naturally heats up the surface of the Planet. However, the recent studies univocally suggest that the most “greenhouse effect” occurs due to the human influence. 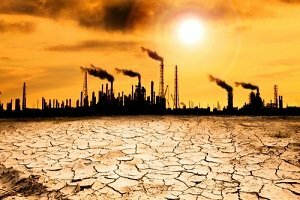 Speaking of particular numbers, in the Fourth Assessment Report, the IPCC states that there is a 90 percent probability that human activities, such as burning coal and oil, over the past half a century, have warmed the Earth. Therefore, despite the fact that there are natural factors influencing climate change, the competent organization are sure that the most impact on climate change occurred due to the human activity. There are vivid effects that will occur in the near future due to the human-induced climate change. First, there is an estimation that in hundred years, the sea level will rise by 1 to 4 feet. That would necessarily cause the flooding of the regions located near sea costs. Moreover, such effect will undoubtedly affect the coast of the United States. Scholars anticipate that there will be changes in precipitations patters, the increase of the intensity, as well as force of hurricanes, and also there will be much more occasions of heat waves striking the surface of the Earth. Considering the entire above, one can say that the explicable scientific evidence suggests that due to the human activity a massive amount of the Carbon Dioxide has been emitted into the atmosphere, and, as a result, had a crucial impact on the climate change. Because of that influence, scientists have been witnessing an unnatural increase of the temperature of the planet surface. Moreover, different climate abnormalities, such as severe hurricanes, prolonged droughts or abnormal amount of precipitation further support the claim that the atmosphere is continually warming. It is important to add that such change will be of a negative character and can further threat the existence of entire humanity. National Research Council (U.S.). (2001). Climate change science: An analysis of some key questions [PDF].